It is that time of the year when we are at it again — making resolutions for the coming year. Some of those resolutions we are able to keep and others, not so much. According to statistics, only 8 per cent people are able to keep their resolutions. So, as well intentioned as your New Year resolution to do Yoga is, here are a few tips, tricks and motivations to make it happen in 2019! Trying to grab the pen from the floor and pull a muscle? Or a heavy aching back after sitting at your desk for 3 hours straight or even longer? All these are really strong indications that you need to get on the mat right away. A few gentle body stretches or quick rounds of Surya Namaskar or sun salutations in the morning can work wonders for your body. Or spending a few minutes. Six minutes to be precise, at your desktop doing very simply yet highly effective Sukshma Yoga asanas, can give you encouraging results and a renewed motivation to stick to Yoga resolution. It wouldn’t be late before you come to know that your body has become more flexible and picking up the pen from the floor doesn’t hurt as much anymore! The main obstacle to not continuing a practice that you know to be beneficial for you is laziness or perceived laziness. Laziness and tendency to procrastinate is merely a symptom and you need to find out for yourself, the possible cause for it. Do not label yourself as lazy and try to get away with it. Instead figure out what is causing this laziness. Sometimes it can be the stress or heavy eating or even lower vitamins. If you have the tendency to procrastinate, you might like to examine your vitamin levels, especially D and B 12 complex. The feeling of tiredness can emanate from lower than normal levels of vitamins and minerals in your system. Also, if your mind is stressed you will postpone tasks to another day. So you need to pump in more energy and enthusiasm. Solution? Yoga! 3. More work, less energy & even lesser time to do it? If you have a high pressure job with tight deadlines, high stake deliverables and resource managing to do, where you could use more alertness, more sharpness and endless source of energy to be productive all day, and yet take calm and well thought out decisions, you cannot ignore Yoga. Yoga helps with honing your decision making skills. Yoga practices help you become a wiser and calmer person. You become capable of taking the right call at the right time without wasting time on re-strategising. “Yoga helped me discover skills and capabilities I never knew I had. You almost become a channel for the most surprising things that flow through you,” says Srinivas Uppaluri, Management Consultant, Bangalore. When your intuition is so heightened, thanks to regular practice of Yoga, you will seldom get it wrong. Now, isn’t that a quality worth having! You can take time specific sankalpa or intention to get into a practice like Yoga. “A vow should be time bound,” says Sri Sri, “Consider the time and place for vows or commitments to be taken.” He shares the example of someone trying to quit the cigarette. “Suppose someone has a habit of smoking cigarettes and says, “I will quit smoking,” but cannot do it. You know why? It is because the commitment is not time bound. You can take a vow for three months or 90 days. Don’t take a vow to start something new or get rid of a bad habit for a lifetime; it is likely you will break it immediately.” If you happen to break it in between, don’t worry. Just begin again. Slowly increase the duration until it becomes your nature. Hand-held video games, social media and birthday parties, all succeed in keeping your children busy, while your spouse may be occupied in checking out the latest designer labels in the newly opened mall. Times are only getting busier, yet yoga can become an excuse for the whole family to take time out. Decide on a fixed time when all of you can practice yoga together. A family that does yoga together stays together! It can be a fun idea to nurture healthy values in your kids as well as a brilliant way for everyone to keep fit – the elderly, spouse or kids. 7. We all need a detox! Yoga works best when practiced over a period of time. A seasoned yogi will vouch for it that, a welcoming benefit of the practice is detoxification of the body. Practice of asanas with awareness of the breath and synchronizing breath with the movement, purges the body of built up toxins or aama as is called in Ayurveda. 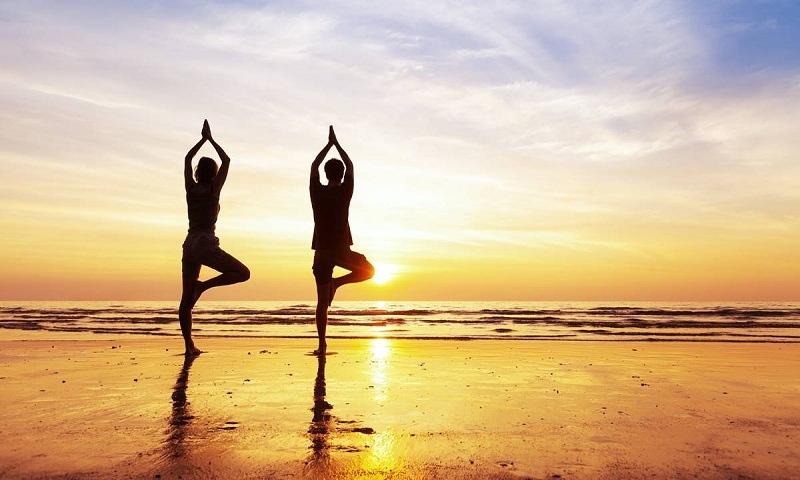 Regular yoga practice helps release stress and toxins deeply stored in the system. As such, you can look forward to a younger-looking healthy body, a peaceful mind and a refreshing personality. Blood pressure, diabetes, anxiety, improper sleep, stress, osteoporosis– yoga has answers to all these. The wise ones choose prevention over cure. Yoga is that step towards choosing prevention over manifestation of disease in the body.